Marcia Seymour-Dane received an OAM for her services to women in the 2018 Queens Birthday Honours. Zonta is perhaps foremost among the many organisations to which Marcia has contributed. 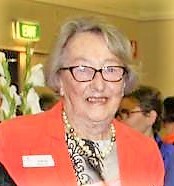 She joined the Zonta Club of Sydney in 1968 and undertook many leadership roles including Club President and District Governor. She helped SOM some seven Zonta clubs, most recently, the Zonta Club of Hunter/Newcastle. Marcia has also been a long-term member of UNIFEM Australia/UN Women Australia. She was its second National President, on the Organising Committee for International Women’s Day Breakfasts in Sydney for over 25 years, and, for 15 years, the maker of thousands of purple ribbons worn by IWD attendees across Australia.